Discover new stories set in the world of the RIVERDALE TV Show! 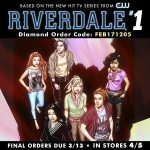 Pre-Order your copy of RIVERDALE #1 today! GET A SNEAK PEEK AT RIVERDALE CHAPTER 6: FASTER, PUSSYCATS! KILL! KILL! Watch the extended trailer for The CW’s Riverdale TV Series! 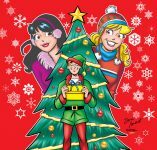 Archie Comics 2016 Holiday Gift Guide!